© Karla Cote. All rights reserved. 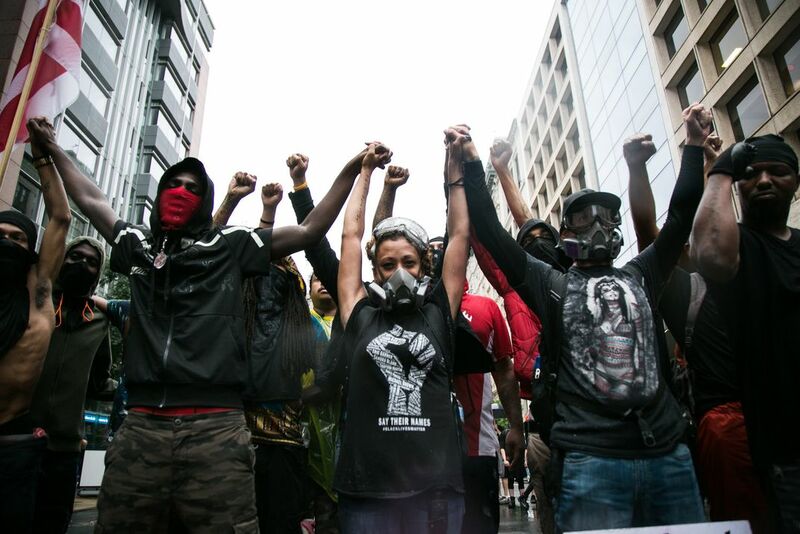 Members of the local Black Lives Matter contingent in Washington, D.C. raise their fists in the air at the one-year anniversary of Charlottesville's Unite the Right rally. Protesters gathered at 13th Street NW in Washington, D.C. on August 12, 2018. A resounding similarity between these two protest actions includes the fact that many local residents showed up to protest white supremacy in the United States. While the white nationalists and supremacists tend to travel from remote locations across the nation to these rallies, opposing factions are often comprised of those who resoundingly object to outside forces corrupting their hometowns and cities. Thousands of counterprotesters gathered in Washington, D.C. to denounce the second Unite the Right rally. This comes a year after the initial Unite the Right rally in Charlottesville, Virginia where white supremacists marched with torches on the University of Virginia. Clashes in Charlottesville resulted in the untimely death of activist Heather Heyer. I attended protests in Charlottesville and returned to Washington, D.C. to commemorate her memory. I've been following activist movements across the United States since 2014; including Black Lives Matter, immigrant rights, and worker's rights movements. This specific photograph was taken at Lafayette Square. The white supremacists were vastly outnumbered, with an estimated 25 to 30 actually present for the rally. According to the First Amendment of the Constitution, "Congress shall make no law... abridging the freedom of speech, or of the press; or the right of the people peaceably to assemble, and to petition the Government for a redress of grievances." While even members of Congress admit the biggest purveyors of domestic terrorism are white supremacists, the Trump administration has chosen to effectively label members of Black Lives Matter and Antifa as "domestic terrorists." According to The Guardian, a 2017 report compiled by the Domestic Terrorism Analysis Unit asserts “Black Identity Extremist (BIE) perceptions of police brutality against African Americans spurred an increase in premeditated, retaliatory lethal violence against law enforcement.” Despite this, The Southern Poverty Law Center has not labeled Antifa or Black Lives Matter as hate groups. Date Uploaded: Nov. 23, 2018, 3:31 p.m.